San Diego Gas and Electric will need to turn off the electricity for the hotel on Monday- April 25- from 11am-2pm for planned transformer replacement. Please contact us with any questions or concerns and thank you for your patience during this maintenance. 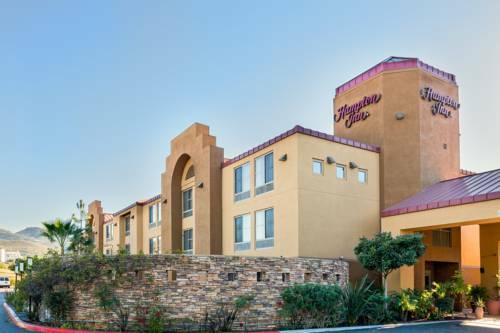 The Hampton Inn San Marcos hotel in California is conveniently located just off Route 78 at Twin Oaks Valley Road. Nearby the hotel our guests enjoy area attractions such as Legoland The Wild Animal Park and the fabulous beaches of California. The Hampton Inn hotel offers clean and comfortable rooms with amenities such as coffeemaker hair dryer iron and ironing board data ports and complimentary HBO available in all of our spacious rooms. Enjoy local phone calls and no surcharges for using a calling card. Our beautiful hotel lobby is host to our complimentary breakfast served every morning. The hotel has easy access to Cal State San Marcos Palomar College and Twin Oaks Golf Course. We are located minutes away from the famous Restaurant Row in San Marcos California with over 20 restaurants to choose from. Come let us welcome you to our Hampton Inn Family. We love having you here at the Hampton Inn San Marcos hotel in California. all reservations must be guaranteed with a major credit card or advance cash deposit to hotel regardless of time of arrival. all reservations must be cancelled 24hrs prior to arrival host time unless deposit required. ~29 miles from San Marcos. ~28 miles from San Marcos. ~51 miles from San Marcos. ~49 miles from San Marcos.